Before the new release, EsPReSSO had a simple SAML editor where the decoded SAML messages could be modified by the user. We extended the SAML editor so that the user has the possibility to define the encoding of the SAML message and to select their HTTP binding (HTTP-GET or HTTP-POST). XML Signature Wrapping and XML Signature Faking attacks have already been part of the previous EsPReSSO version. Now the user can also perform DTD attacks! The user can select from 18 different attack vectors and manually refine them all before applying the change to the original message. 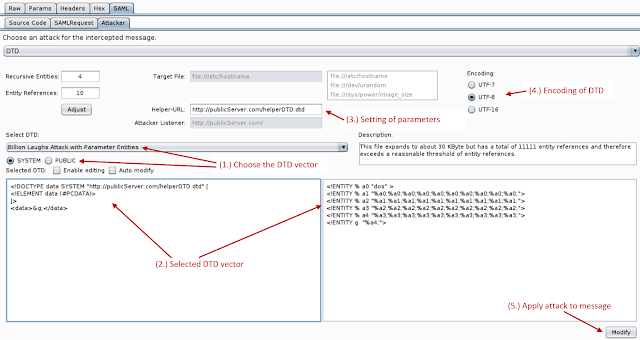 Additional attack vectors can also be added by extending the XML config file of the DTD attacker. 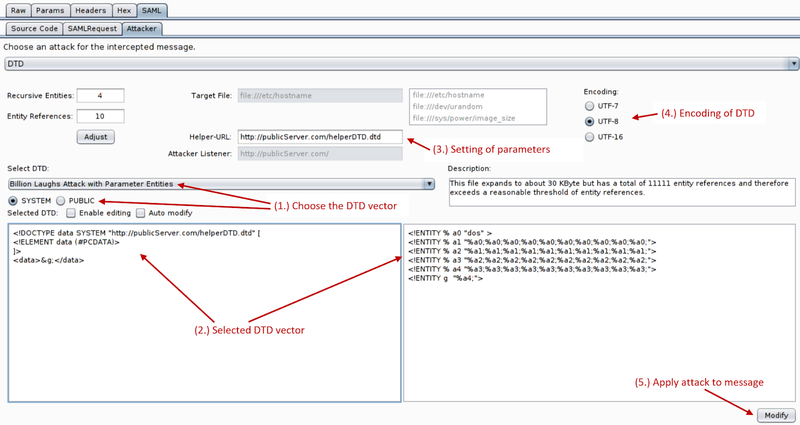 The DTD attacker can also be started in a fully automated mode. This functionality is integrated in the BurpSuite Intruder. We implemented a CertificateViewer which extracts and decodes the certificates contained within the SAML tokens. In addition, a user interface for executing SignatureExclusion attack on SAML has been implemented. Additional functions will follow in later versions. Currently we are working on XML Encryption attacks. This is a combined work from Nurullah Erinola, Nils Engelbertz, David Herring, Juraj Somorovsky, and Vladislav Mladenov. The research was supported by the European Commission through the FutureTrust project (grant 700542-Future-Trust-H2020-DS-2015-1). 0 Response to "Support for XXE attacks in SAML in our Burp Suite extension"